I had never been an animal rights activist before I watched the movie Blackfish. I mean, I’d always loved puppies and kittens and hated the idea of shelters, but I wouldn’t say I’d ever really preached about it. And I know, Blackfish is considered “old news” since it came out in January 2013, but I think it’s something that should still be revisited. After all, it has been the source of a lot of new animal activists—including me. For those of you who don’t know, Blackfish is a documentary aimed at exposing SeaWorld, as well as other parks affiliated with SeaWorld, for their torture and cruelty towards orca killer whales. The film interviews former animal trainers, divers, and executives to get their real-life stories and experiences working for SeaWorld. As a child, I went to SeaWorld only once, but I still remember how I loved watching the trainers play with the whales and seeing how excited both the trainers and the whales seemed when they were doing their tricks and performances. Even more, I thought they (as in the whales) loved doing it. I still remember leaving the show thinking, I really want my own whale to keep at home with me forever! Little did I know, that’s exactly what SeaWorld was doing. When I first watched Blackfish over a year ago, my entire perception of SeaWorld completely changed. I’m appalled that I ever paid to step foot onto SeaWorld’s grounds and watch such cruelty towards animals. The documentary focuses on a few select stories of animal trainers being killed in the pools by “trained” orcas. The filmmaker interviews numerous former employees as they speak of how much unconditional love they had for each whale that they worked with in the park. They all also said something along the lines of how they were either too young, too naïve, or too worried about losing their jobs to realize or speak up about how bad SeaWorld was for the animals. One former employee stated that every night after shows, the whales go back into a small, confined pool where they stay for hours upon hours in the dark. Orcas are used to being in the large, open ocean with the rest of their families—not a restricted pool as if they’re in a prison. Another said that the whales hated going in there so much that the trainers were told to “hold back” food (aka starve them) and only feed them once they went into their pool. Unwillingly, the trainers went along with not feeding the poor animals so that they would have no choice but to cooperate or starve to death. The same would also happen if the whales did not complete a trick correctly. It was either do the trick correctly and eat tonight or starve. SeaWorld was known for a while to lie about the “facts” they gave to their visitors about the whales. For example, SeaWorld once trained their employees to tell guests that orcas live in captivity for about 25-30 years, but live even shorter lives in the wild because they don’t have access to the medical supplies and treatments that SeaWorld provides for them. Once scientists started to do research about orcas, they eventually found orcas actually have about the same lifespan as humans. WHAT?! Turns out that orcas live to about 50-80 years old in the wild where they’re not treated like prisoners. Orcas are wild animals and will always have their natural instincts, but when starving to death, frustrated, and confined, they are obviously more likely to act out and hurt their trainers, which is probably why there have been so many incidents and deaths of trainers at SeaWorld and their affiliated parks. So how has this affected me personally? I love animals. And no, I’m not a crazy vegetarian “tree hugger,” but after seeing Blackfish for the first time last year, I made my friends, roommates, and boyfriend watch it with me……at all different times. I think I watched it about 4 times in one week before I decided to really start researching more into it. Obviously a lot of my research led me straight to PETA where I began viewing their activist missions and protests. I finally came across this timeline of “Lives Stolen by SeaWorld” that put everything into perspective. And this isn’t even including human trainers who died—just whales. For a full list of human/orca reported incidents around the world, click here. After watching the documentary and researching so much into it, I really became angry with everything SeaWorld has done since they first opened. The advertisements, the promotion, the “cute and cuddly” souvenir toys, all of it. Why should these large animals be held and starved to death against their will just for the entertainment of others? Whenever I hear someone talking about SeaWorld or killer whales, I always somehow work my way into the conversation and explain my experience after watching Blackfish. Even if they don’t want to hear a single word of it, I hope I at least piqued their interest and make them want to watch the film and/or research the facts. SeaWorld is unthinkably cruel to their animals, and I strongly encourage you to watch the movie Blackfish so that your eyes will be opened to this malicious evil, as well. This film created much more chaos than I think the creators originally anticipated. Because of this, SeaWorld’s stock prices have dropped more than 30% and innumerable SeaWorld activists have been made out of your regular animal lovers—like me. Even celebrity sponsors and regular entertainment performers backed out of their deals with SeaWorld after all of the uproar. For those of you who are interested, Blackfish can be found on Netflix or on Amazon Instant Video for a small fee. Watch what Director Gabriela Cowperthwaite says about the film and her experience here. Once you watch it (or if you already have) and feel the same way I do, sign this petition to free Tilikum, SeaWorld’s most aggressive orca whale to-date. On SeaWorld’s own website, they wrote up a lengthy post about “the truth” about the movie Blackfish. SeaWorld tries to argue against many things brought up in the movie, but most are already obvious from solely watching the film. For example, they argue that SeaWorld does not and has not collected killer whales from the wild in over 35 years and Tilikum wasn’t even captured by SeaWorld. We know this. The movie showed one man who captured whales decades ago who captured Tilikum and brought him to Sealand of the Pacific in Canada. Tilikum was only first affiliated with SeaWorld when he was purchased by SeaWorld after a tragic accident at Sealand of the Pacific that resulted in a trainer’s death. SeaWorld also points out that they don’t actually separate a mother from her calf. However, they continued to say that one was separated at 12 years old while another was separated at 4 1/2 “because she was disruptive to her mother.” Would you take a toddler to an orphanage at 4 1/2 years old because he or she cried for her mother all the time? Probably not. It was also said in the movie how killer whales have a piece of the brain that creates strong emotional attachments, and they never actually leave their family’s side in the wild until they die. So why separate them at all when we know these facts? 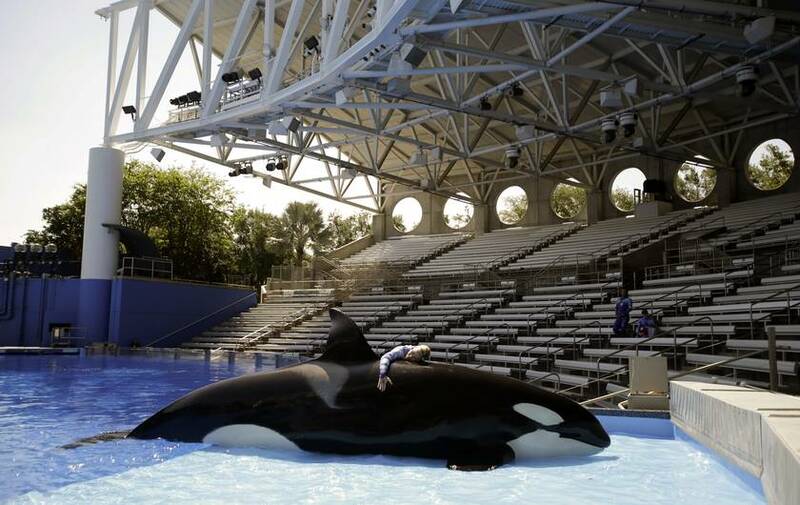 SeaWorld continues to argue about a touchy subject—the death of Dawn Brancheau. They say that they have never blamed her for her death. However, aside from all of the news footage shown in the film that successfully proves SeaWorld wrong on this matter, in January 2014, the top executive at SeaWorld Entertainment Inc.’s largest shareholder, Stephen Schwarzman, said in an interview that SeaWorld “had one safety lapse—interestingly, with a situation where the person involved violated all the safety rules that we had.” Quickly enough, SeaWorld attempted to cover up this quote by claiming that Schwarzman “misspoke” about the topic because he wasn’t “properly briefed” about talking about the trainer’s death. So, looks like SeaWorld did blame Brancheau. You can read what else they said about Blackfish here. More recently, however, SeaWorld decided to run a new campaign on Twitter utilizing the hashtag #AskSeaWorld in attempt to encourage animal lovers to question SeaWorld about anything because they have nothing to hide. However, most of the questions they decided to answer did not pertain to Blackfish and they mostly just answered simple questions about their animals’ day-to-day lives and what type of breeds of animals they have in their park.